You are currently browsing articles tagged content strategy. I have been frustrated recently with the tendency to refer to content types as “content.” Images, videos, text, PDFs, Flash files — these aren’t content; they’re content delivery mechanisms. Content is an idea made consumable. Ideas evolve into creations which are then delivered via a variety of asset types. These assets are not what’s important; they’re just the vehicle to deliver the idea. If you write a brilliant article on the debt ceiling, the article isn’t the content; your thoughts and ideas put into words is the content. 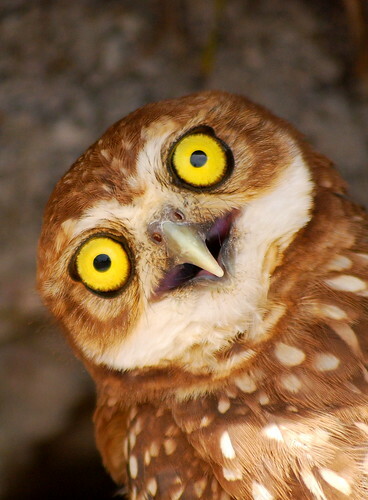 If you have a photo gallery on Flickr of owls with stupid expressions on their faces, the gallery isn’t content. The photos aren’t content. The content is the concept: the idea of curating the photos, captioning them, and creating a new way of looking at them. So when we are creating a content strategy, let’s not focus on what assets there are, but let’s look at the ideas. Are we delivering the right ideas to the right people at the right time and place? What do you think Content is? Reputation management services have been getting a lot of attention. A recent New York Times article featured these companies, who use a variety of ingenious techniques to help counteract negative attention online. Certainly when others are posting things about you or your business that you can’t control, a service like this can be helpful. One bad review can rise to the top and undermine your reputation. But another key to reputation management is being proactive about controlling your content in the first place. A good content strategy should include a plan for social media. The challenge is to balance the dichotomy of the essential spontaneity and immediacy of social media with the need for planning and controlling the content you release. The elements of content strategy for social media include the creation of a content calendar, rules of engagement, and editorial guidelines. A Content Calendar plans your content distribution in advance, to account for seasonal content, new products or services being offered, and key announcements. It is a living document that by definition will change to respond to relevant news, current events, memes, and changes. But planning ahead determines you’ll always have appropriate content ready, and allows advance planning for releasing that content. Social Media Guidelines are the golden rules by which all your social media posts are governed. This is particularly important for those for whom multiple people are posting via blogs, Twitter, or other channels. For a small company or a single individual, these guidelines can be simple, outlining which topics are appropriate, whether it’s acceptable to mention competitors or endorse vendors, talking about current projects, and so on. For a larger company, it might include legal restrictions (consult with the company’s legal team), privacy policies, and rules around the protection of intellectual property. It is important, however, to not be too restrictive with these guidelines, as it undermines the essence of social media — the individual conversation. IBM was a pioneer in creating social media guidelines, creating a wiki in which employees could discuss and contribute to the rules and guidelines for social media. Together, IBM’s employees created a guide to posting that serves as a model for others and continues to evolve with evolving social media channels. Social Media requires planning, just like any other communications channel. Make sure you have a content strategy in place before you start participating. The average Facebook user creates 90 pieces of content each month. And more than 30 billion pieces of content — web links, news stories, blog posts, notes, photos, etc. — are shared each month via Facebook. Wouldn’t it be nice if you could use some of this content for your brand? Use their ideas. People who engage with a brand on Facebook, whether by responding to a wall post, posting on their own, or commenting on a photo or video, are people who are already excited about your brand. Take advantage of their good ideas and use them to generate new content, or even new products or campaigns. Every time a user writes “I wish you…” or “why don’t you…” on your wall, pay attention — it could be your next service offering or product idea.Example(s): B2B company could create a white paper around subjects being discussed on their Facebook wall, or a retailer could introduce a product in a new color that’s frequently requested. Crowd-source content. You can ask the people who like your brand to create content for you. Inviting participation from your fans will spur loyalty, engagement, and new ideas.Example: A food company introducing a new product might ask users to provide recipes using the product, or meal ideas. Continue the conversation. Every piece of content on your Facebook page is another opportunity to reach new fans and engage with your existing ones. Pay attention to what people are saying and respond — ask them to elaborate.Example: If someone says they love the shoes you’ve sold them, ask why. A discussion of the great colors and features of the shoe will only reinforce the positive post for others who see the discussion (and the additional feedback may provide you valuable customer insights as well). Boost your SEO. By engaging users on Facebook with relevant content, you’ll provide the impetus for users to generate new content using the relevant keyword search terms they use.Example(s): In a recent report, Forrester cited the example of Alberto-Culver’s hairstyle videos for Nexxus, which were distributed via social media web sites including Facebook. Nexxus’ content now dominates search results pages for a number of hairstyle-related keywords, and, according to Forrester, has increased the Nexxus brand’s online recognition by 600% since the beginning of the promotion. There is an abundance of content created by people who are your brand advocates. Use it! The conference features four tracks to address the needs of beginners and experienced content strategists alike. I will be leading the track (or “stream,” as the UK folks call it) for Content Strategy for Social Media and Mobile. Developing a complete content strategy is no longer just about web content. With the explosion of social media as both a popular consumer choice and an invaluable business platform, it is critical to consider how your strategy works in these new channels. More and more, people are consuming content not on their computer but on mobile devices. And now, tablets are shifting the digital paradigm again. How do you plan for something like Facebook, where the conversation changes and evolves daily? What’s the right content for a Facebook page, and what content would be better on YouTube, in an app, or on your web site? How do you know what is the right channel to distribute your content? Do you even need a Twitter account, and if you do, how can you use it strategically to distribute valuable content? And how can you measure your success? In this track, we’ll explore key social media channels and how to integrate them into your overall Content Strategy. Learn how to develop effective content for Facebook, YouTube, Twitter and more. Discover the value of social bookmarking and content sharing. Workshops, case studies and interactive sessions will explore the challenges of creating an effective and usable Content Strategy for these moving targets. You’ll come away with an understanding of best practices for social media and mobile, and the skills you need to develop effective, integrated Content Strategy across all of today’s dynamic digital media. Please let me know if you have particular questions you’d like answered or topics you’d like to discuss at the conference. I would love to hear from you!